This year at Flowers with Elegance it’s all about individuality. Brides and grooms are breaking out of the ‘norm’ and traditional wedding themes and venturing into untrodden waters in search of uniqueness. 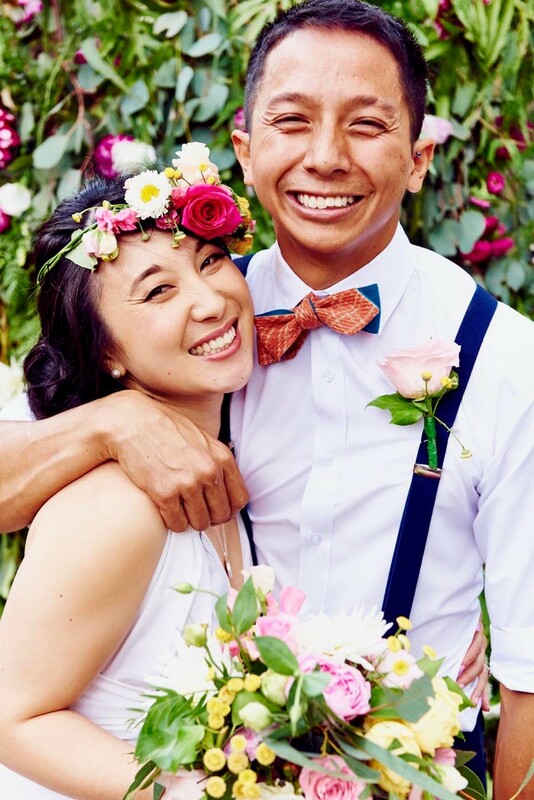 We had the pleasure of being a part of styling one of the most unique weddings of 2017 – Nam and Judy’s wedding was fun, romantic, delicious and catered for the young and old. When we met up with the bride and groom, the brief was garden style, low key with food trucks, a gelato stand, picnic rugs for the guests and a children’s entertainer all set in their backyard. 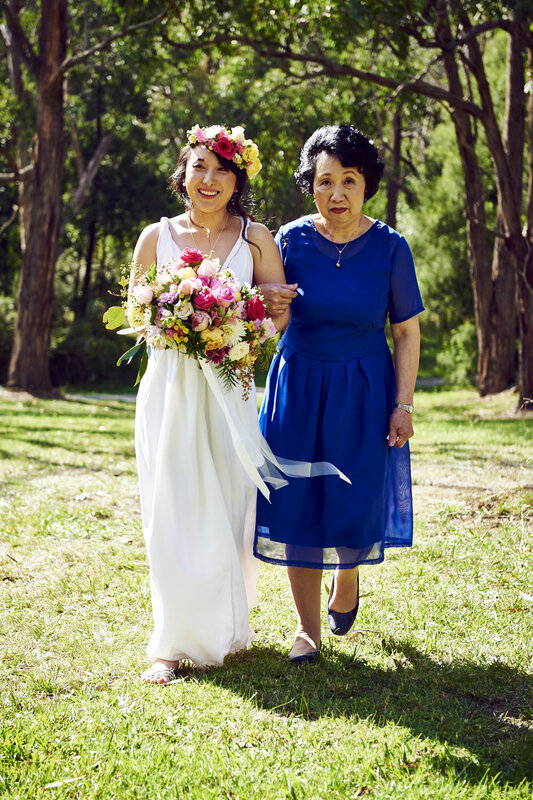 The ceremony was to take place in a reserve park behind their house under an enormous tree. Judy loves all flowers and had total trust in our ability and so left the styling and choice of blooms entirely to us. So we styled a bright and colourful palette to match her bright and cheerful personality. We made the bridal bouquets, hair crown, table centrepieces, flowers for the shed converted to a bar, flowers for the aisle and the boy’s boutonnieres in shades of pink, pale pink, yellow, cream and silver green native foliage to incorporate the native surroundings of the reserve where their ceremony was taken place. Once we had our color palette sorted, sourcing the flowers was the next step. Everything we used was locally grown and in season. 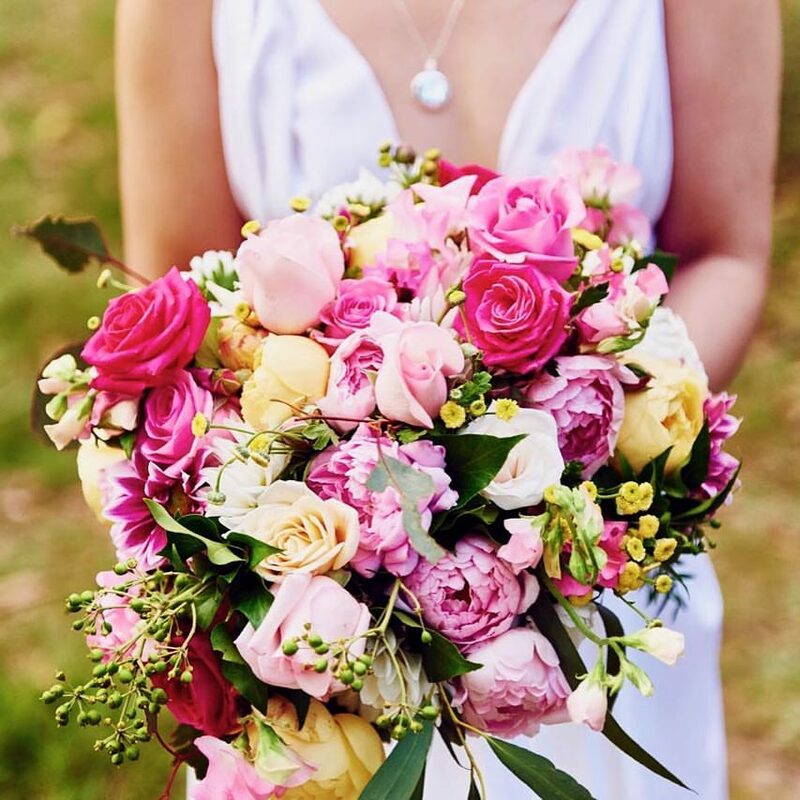 For the bridal party we chose David Austin roses for their effortless beauty and fragrance, sweet pea for softness, chrysanthemums for their different shapes and textures, dahlias for their feminine touch, as well as 5 different types of foliage for interest. So, when put together, the bouquets and flower wall were free and organic and gave a luscious garden feel. The result was a grand success! We also constructed a flower wall as a photo focal point for the day. Due to the bright color palette of the bridal party, we chose a more subtle color scheme for the wall in shades of pale pink, magenta and green foliage of different textures and shades. The wall was a big hit with the guests and the bridal party! 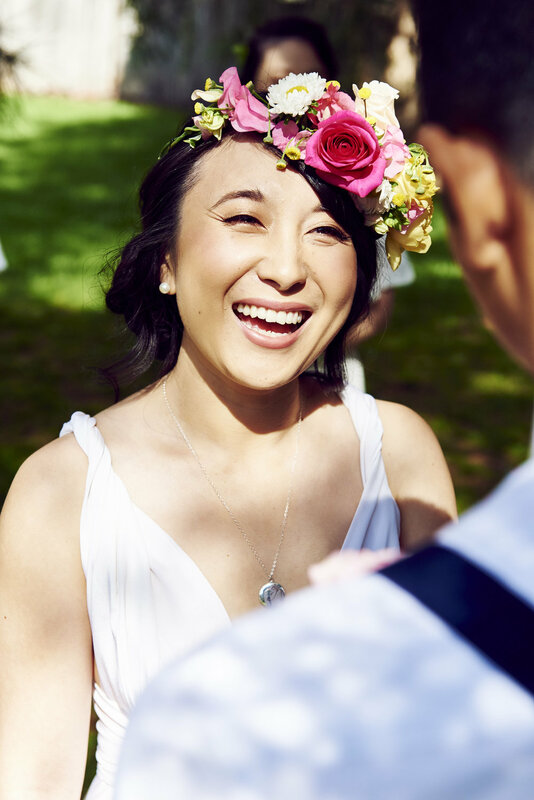 Judy and Nam's wedding is one of the best wedding we've had the pleasure to be apart of. The couple has thought of very aspect of the day, taking in careful consideration for their families and friends with children by having a children's entertainer, a gelato cart as well as amazing food with a variety of food marquees and shed-converted bar well stocked set up for the grown-ups. 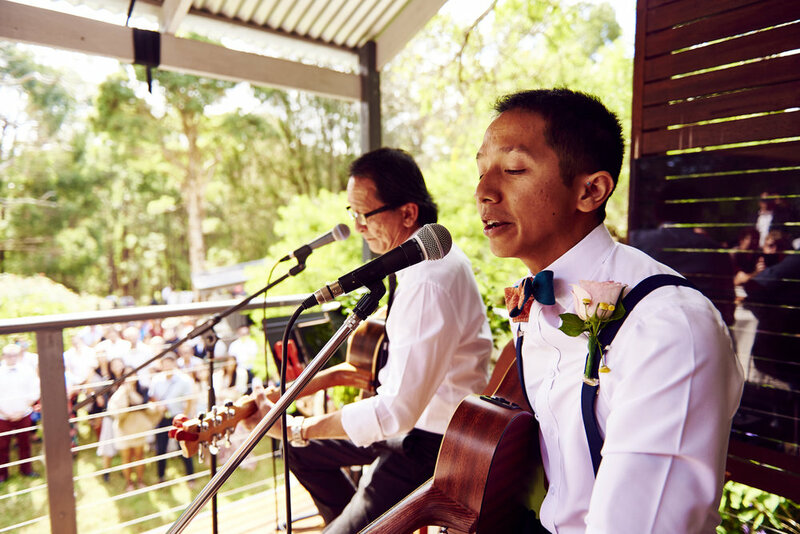 Not to mention live entertainments and heartfelt speeches to make their laid back garden wedding a romantic event of the year! There was not a dry eye in the crowd as father and son hit it off with a beautiful duo dedicated to the loves of their lives *sigh*. This wedding couldn't have been more unique and complete! Laurence James Photography had captured the day in amazing detail. These images were exactly how it appeared on the day – bright and vibrant colors, a couple so in love, and lots of laughter all set in a beautiful backdrop created by Mother Nature.